The “Blog” of “Unnecessary” Quotation Marks: "goes great"
Just discovered your blog, and it is hilarious and painful to see all these misused quotation marks. Keep up the good "work!" But pop DOES go great in food. Everyone knows that just about any recipe that requires a liquid like chicken or beef stock can be enhanced by replacing some or all of the stock with red wine or beer. You can also use juice or pop. Or Soda if you call it that. a bunch of chicken pieces,boneless or otherwise. Stick it in a slow cooker on low for 8 hours. I think 7up or Ginger Ale would be a nice variation. My first thought would be to put it in Jell-O. Am I totally "white trash"? When I was a kid, we used to put a little 7-Up in our chicken noodle soup. As I recall, it was quite tasty. I'll have to try that again. 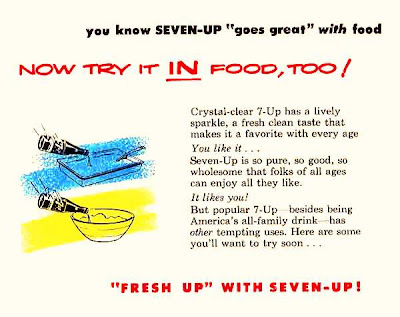 Ever heard of 7-up cake? It's delicious! 'Course it also has 3 sticks of butter in it, which makes anything taste great! You've obviously never had a coca-cola cake. I have this horrid memory of making fondue with swiss cheese and Sprite in my Junior High Home Ec. class, which would have been in the 1970's. "Goes great" is obviously code for "Blech". Does that Kenneth who commented live in Colleyville? If so, hi from your sister, who was going to say the same thing about Mom's Coca-Cola cake!!!! Ludmilla, my hubby's family totally puts 7-up in their jello. Of course they may be white trash. Or at least hick-ish. It's really yummy though. other tempting uses?? This is how urban legends start!